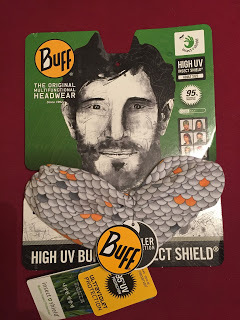 According to the website, the UV Angler Insect Shield Buff is ‘Based on High UV Protection Buff® (so it offers at least 95% protection from harmful UV rays). Insect Shield Buff® has been impregnated with a special long lasting, effective, odourless and convenient form of insect repellent. Effective for at least 70 washes against mosquitoes, ticks, ants, flies, fleas, chiggers and midges.’ so it sounded just ideal for Thailand where there are obviously loads of mosquitos that are rather partial to munching on some lily white English flesh! They can be a real pain when you fish into dark and especially when using a head torch as they seem hell bent on getting you to swallow them! 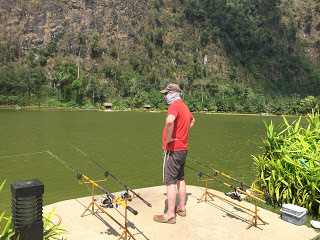 My first day at the lovely Exotic Fishing Thailand in Phang Nga and it was hot, very hot, for most of the morning you are sheltered from the heat by the sala but as the sun moves round there is no escape until it starts to go down behind the impressive mountains that overlook the fishery. It was during these periods that I found the UV Protection properties of the Buff indispensable, there are many wears to wear a Buff but just wearing it around your neck protects the vulnerable back of your neck or pulled up over your nose and used in conjunction with a baseball cap and sunglasses, your head, face and neck are fully protected. I caught lots of fish at EFT with the last half an hour as it got dark, particularly productive. 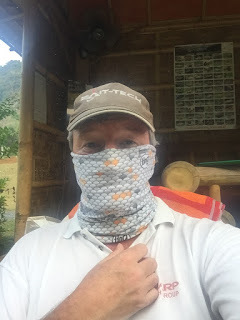 You can read more about the trip here – Thailand Trip and during this period, I would wear my Buff over my mouth and I can honestly say I didn’t have any problems with mozzies or any other bugs, I was a little worried that there might be a strong insect repellent smell that would become cloying after a while but this wasn’t the case at all. 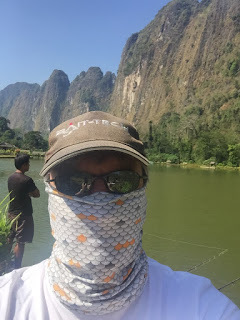 So yet another great product from Buff and it’s amazing how much protection you can get from one piece of material, my head was fine but despite using an insect repellent spray, the mosquitos had a field day on my legs! It’s a shame they don’t make leg Buffs! The UV Angler Insect Shield Buff retails for £22.00, of course if none of the Angler designs are to your taste, there are some more in the Adult Headwear UV Insect Shield section.